This fascinating structure near the Large Magellanic Cloud (LMC) contains a large HII emission region referred to as LH-a 120-206 (N206) and a supernova remnant (SNR B 0532-71.0), as described by Williams et al. (2005). �The SNR has an estimated age of 23,000 – 27,000 years. �The main emission region is about 13 arcmin long in the NW-SE direction (horizontal in the above image). �I believe that the �SNR (also often referred to as N206) is the circular structure near the top left (NE) of the main nebula. �Wiliams et al. (Ast. J 132, 1877-1889, 2006) did not find infrared emission from the SNR pointing to the absence of a substantial dust cloud in the vicinity. 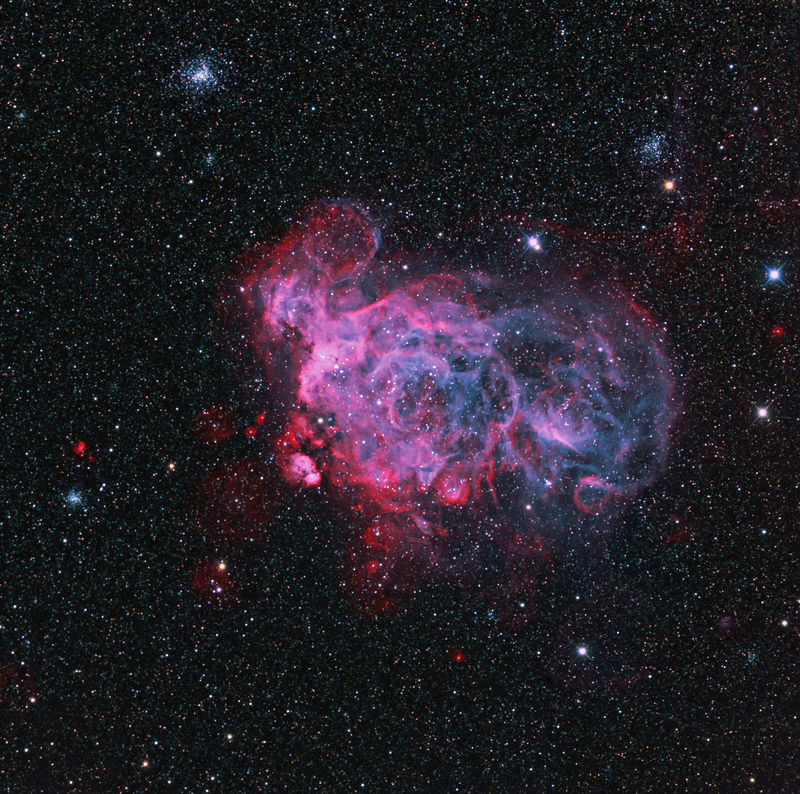 �The nebular detail and color comes from the use of oxygen (OIII – color mapped to blue-green) and hydrogen (H-a – color mapped to red/magenta) narrowband filters. �Star colors come from RGB filters. ��The globular cluster in the upper left is NGC 2031 and the open cluster of stars toward the upper right is NGC 2010.� Show below (courtesy of S. Rasool) is an annotated image of the other structures. Hey Don I love what you have produced here, the colours are technicolour wonderment! The SNR is the round structure near the top of the main complex. My only criticism is that the RGB is a bit short to do the background of the LMC full majesty. 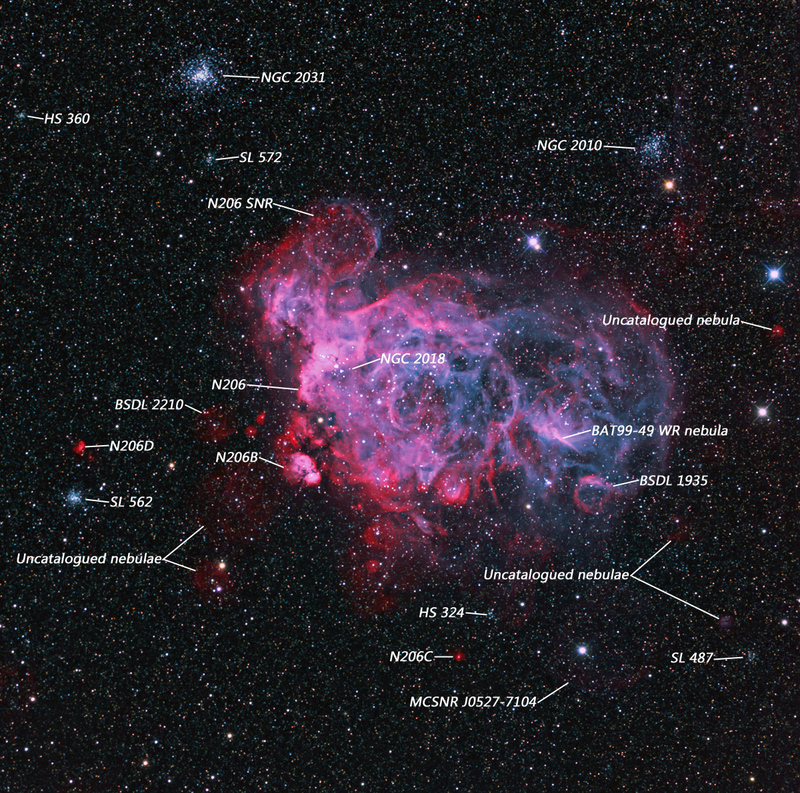 Always love how deep your images are, there must surely be some uncatalogued nebulae in there! Amazed you haven’t discovered a PN yet! Thanks, Sakib. I thought that round object was the SNR. I’ll let you discover the PNs! !